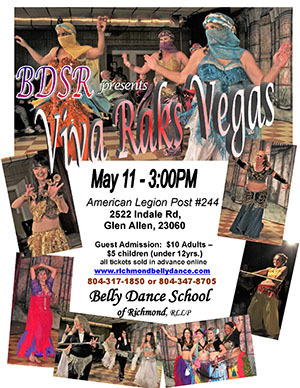 The Belly Dance School of Richmond offers an unrivaled host of talent and experience in the Richmond, Virginia area. The school staff is comprised of instructors with a collective experience of more than 100 years, and a wide diversity in style, technique, and method. Middle Eastern Cabaret is our main focus utilizing improvisational interpertation. We offer class instruction on Monday nights for beginner to advanced students, participate and perform in a variety of local community events, and produce an annual belly Spring Show performance showcasing our students and other local performers. The classes are small and very personal with a lot of individual attention. Occasionally we organize a workshop or a roadtrip for the students, and we have lots of fun dancing together. Belly dance is a sensual and feminine Middle Eastern performing art, enjoyed by women and men of all age and sizes. It's great exercise and entertainment for the entire family. Please join us for a class or enjoy one of our many performances and support the local dance community. We follow the Henrico County Public School closings for inclement weather; however, please use your own judgement when driving in inclement weather! Introductory classes are scheduled in quarterly sessions. A class registration form with tuition and other information is located under the registration page. Directions: Travel west on US33 west Staples Mill Road, turn right onto Mountain Road, cross the railroad tracks and turn right onto Purcell Road, finally turn left onto Indale Road. To insure your place in class, please return the registration form (found under the Registration tab) along with your check payable to Belly Dance School of Richmond, RLLP. Students will be introduced to complex techniques, layering, and improvisation. Use of various props (veil, cane, tambourine, and zills) will be taught, as well as, improving their stage presence and various specialized styles. The introductory class is structured for beginners to define basic technique for a strong foundation in all styles of belly dance, introduction to cultural protocol and history. Dorma has been a student of belly dance since 1995. Studies began with Sheva in Richmond, Va., as well as various other teachers in and around Richmond, and a multitude of Master Teachers and workshops along the East Coast, Turkey, and Egypt. I'm an accomplished seamstress and truly love to design and sew costumes with all the beads and baubles and sequins. I'm hopelessly enamored with music, dance, design, color, shiny-sparkly things, and jewelry, and all the girly things about belly dance. As an instructor, I truly enjoy watching students grow, honing their skills, building confidence, and the joy they find in dancing. 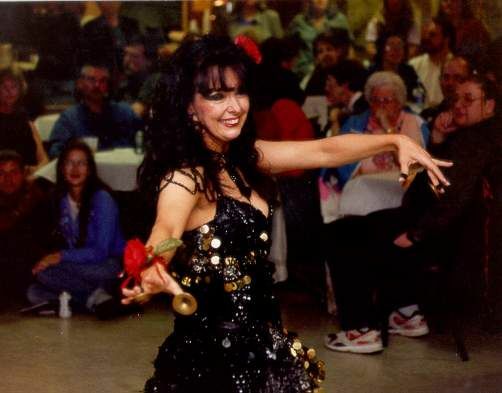 Morgana Perizada began belly dancing in 1999 after viewing a video of Kathryn Ferguson, and began taking classes through Chesterfield Parks and Rec and Sheva's School of Belly Dance soon after. She has continued her dance studies with a variety of other instructors. 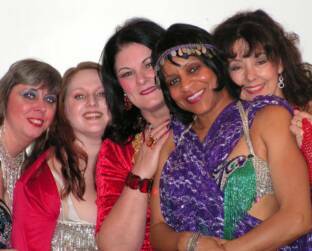 Belly Dancing has blessed her with many wonderful friends and experiences and she looks forward to many more. Debby joined Sheva’s School of Belly Dancing in 1980. She became a featured dancer for Harry Tatian’s Near Eastern Ensemble and for Sheva. In 1982 she was 1st runner up at the East Coast Belly Dancer of the Year contest and was featured on TV 8’s “PM Magazine.” Performances have included festivals, fairs, museums, schools, and restaurants. Celebrity performances included Pierce Brosnan, Jack Lemmon, and Peter Gallagher. She has studied extensively with many national and international artists and is still influenced by Morocco of NYC. Debby’s focus has now changed to teaching. She excels with zills and brings a lively, heartfelt love of the dance to every class. 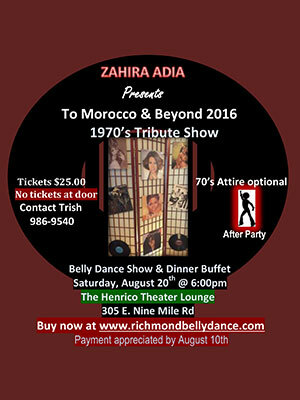 Zahira Adia started dancing in 1987 with Sheva's School of Belly Dance and later became an assistant teacher for Sheva. Teaching for 13 yrs at Pine Camp Cultural Arts Center / City of Richmond Teaching for 3 yrs at American Family Fitness Center.Dance performances to include Virginia Commonwealth University's Cultural Arts Day, The Women's Annual Health Fair and The National Girl Scout's Convention. Assistant teacher for The Belly Dance School of Richmond. Janiece began a love of dance when she was just three years old, eventually taking ballet, tap, jazz, pointe, and just about everything else considered "dance". However, when she was 11 years old, her mother discovered belly dancing and they both began lessons with Sheva's School of Belly Dancing. Although she has taken belly dance classes from local and nationally known dancers, Sheva was her mentor. Janiece has been teaching for a number of years, first for Sheva, then BDSR, and on her own. 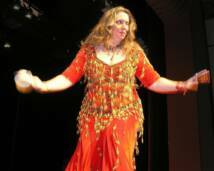 She enjoys the camaraderie of the dance world as well as the individuality belly dancing allows each person to express. Tuition is due the first Monday of the month. A late fee of $5 will be assessed for tuition not paid by the second Monday of the month. To insure your place in class, please return the registration form along with your check payable to Belly Dance School of Richmond, RLLP. Annual Spring Show & Hafla! All tickets sold in advance ONLY! To purchase tickets for the Spring Show online, please select ticket option, fill in the ticket holder's name, and click "Add to Cart" below to purchase via PayPal. Note: All tickets will be held at the door. Local Dancing - Please support the Richmond area belly dancers every last Tuesday of the month for Tummy Tuesday @ Positive Vibe Café, located in the Stratford Hills Shopping Center on Forest Hill Avenue, Richmond, Va. Local dancers (instructors, students, and sometimes musicians) entertain you while you dine. Dancing starts at 7:00pm. If you are interested in performing, please contact Kim at [email protected] Dinner reservations are encouraged as the restaurant fills up quickly (804-560-9622). We appreciate your support of the local belly dance community! 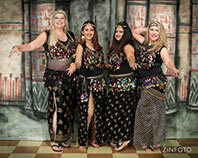 The Belly Dance School of Richmond is available to dance at your public or private event! Note: No all male bookings will be accepted. Queens of the Universe The Queens of the Universe is a middle eastern bellydance troupe based in Colonial Heights, Va which teaches and performs cabaret style dance. Intermediate and advanced students of the school along with the instructors were invited to perform at the Powhantan County Fair in Powhatan, Va.
Intermediate and advanced students of the school along with the instructors were invited to perform at the Charles City County Fair, Va. The Richmond Raq Stars (representing the Belly Dance School of Richmond) traveled to Somerset, NJ to perform at the annual Rakkasah East belly dance festival. Note: All purchased tickets will be held at the door.